Drinking with mathematical precision is easy: Just use the ounce marks and their equivalent constants. 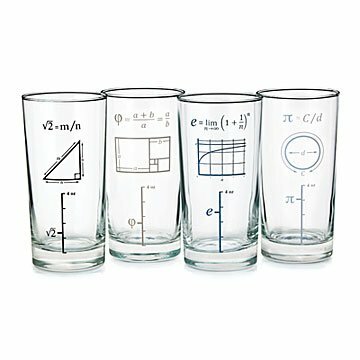 Whether it's advanced calculus or just calculating ideal ice to iced tea ratios, stay hydrated in statistical style with this set. Drinking with mathematical precision is easy: Just use the standard ounce marks and their equivalent constants, then geek out over the expanded formulas—all presented in delightfully differential colors like graph paper blue and #2 pencil gray. Glassware made in New Jersey. Decorated in Blanchester, Ohio. v2 (Pythagoras's constant, the square root of two) - 1.414 oz. f (Phi, the golden ratio) - 1.618 oz. p (Pi) - 3.14 oz. e (Euler's Number) - 2.718 oz. 5.5" H x 2.875" dia; 13 oz. Perfect for measuring out cocktail drinks and for the nerd! Great exposure to mathematical equations through an object of every day use. These glasses are great fun! They have beautiful visual explanations of the origin of each of the numbers, and allow you to make drinks with that number of ounces. Wonderful idea! This was a perfect gift for the math nut. Worried about the formulas coming off in the dishwasher. Nothing worse than a half-formula! Will just be careful. It was the ideal gift for someone who has everything he want and needs. Great gift for my nephew! It was a gift for my daughter! It is as though the glasses were custom-made just for her!